Welcome to Submit! 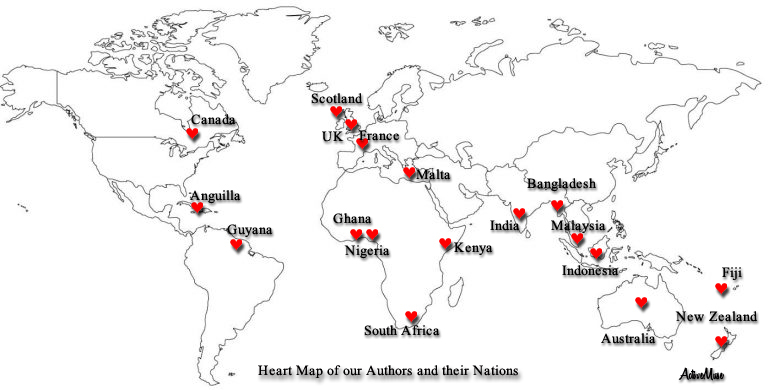 Before Submitting, please take a look at our "Heart Map of Authors". Do you want you country to heart here? Again and Again? Please read our interpretation of Theme Earth, given in (1) to understand what we want. Please read all the instructions for the two calls, and (4) General Rules before submitting. We do not charge any fees for reading or publishing your work. Enter all the details in the form, upload your work, and click Submit. अज्ञातय Agyataya (Suspense), Spl issue on Theme Suspense. Deadline April 30, 2019. Our interpretation of Suspense. "Tell us a Tale with fear, tenseness, the unknown, shocking, line-scroller, a mystery, a who-done-it, a who-dunned-not, a girl who ditched two oafs, 'my wife is a guy', an unnatural ending, leave us gasping, agog, that has us panting with bated breath, on-edge, waiting to climax..."
Quicks up to 500 words, Flash up to 1000 words, Short Stories up to 3000 words. Poems up to 24 lines. Art work 300 x 300 pixels jpeg file. Only original and unpublished work please. If your work is accepted elsewhere, please let us know. Flash Fiction up to 1000 words, Short story from 1000 - 3000 words, Poetry 10-24 lines, Art work 300 x 300 pixels jpeg file. Submission is ongoing, through the year. Your work should be grammer proofed. The submitted entry is my own work and it is not published in any medium or in any language. Vasant (Spring) April 2019, Issue is LIVE!. अज्ञात Agyataya (Suspense), Spl issue on the theme Suspense will be launched in May 2019. Varsha, (Monsoon) August 2019. Theme to be decided. Issue will be launched in August 2019. Spl Issue, theme to be decided and collection will be launched in Oct 2019. Shishir (Winter) Issue December 2019, theme to be decided. Collection will be launched in December, 2019. These rules are common for all submissions ! We follow the UK style and use William Shunn Manunscript Style . So please download the template and format it accordingly. We use UK style. Name your file as "Surname_title_words". We accept only .doc and .docx formats. All stories and poems only in English please. We appreciate your Native voice, so write naturally. The Work should not not be offensive, libellous, harmful or otherwise cause legal problems for the Publisher. The work should not abuse any religion, gender, ethnicity, sexual orientation, or nationality. Contributors should be above 18 years. We accept only original and unpublished work. If your work is published elsewhere, please do not send. After submission, if your work is accepted elsewhere, please send a mail and withdraw. Please proofread and send work without any grammatical mistakes. We will reject the work if any mistakes are found. We are not a paying market and cannot pay for the works that we accept. Decision of the editors is final and feedback on the submissions will not be given.